There will be those who think it is wrong to be happy with a 2-2 draw with Walsall, but it’s all about context. Was it Sunderland’s best performance of the season? Certainly not. Should we be looking to see off teams like the Saddlers? Most probably. But having gone down to 10 men and two goals behind, then some credit is due for the fightback. Of course, it’s disappointing not to take all three points, but it was important to take something from the game. Another disappointing factor was the dismissal of Max Power. The midfielder saw red at Bescot Stadium, and it has to be said that a spate of sendings off is something of concern. In this age of knee-jerk reactions there will be those who want him sent out on loan, sent to Coventry, or sent packing (you can choose your own). However, while we could do without Power being suspended again – there’s no doubt he brings something extra to the team – I don’t think there’s any need to panic. Maybe the manager needs to have needs to have a word with the player about avoiding reckless challenges, although that might be unlikely given that Jack Ross said after the game that the club will appeal the decision. Right or wrong that was Power’s third red of the season, and while there is no doubt that Ross won’t want to take away Power’s competitive edge, it could be toned down at least. It’s a difficult balancing act, but one which must be achieved if Power is to spend more time on the field and not on the sidelines due to suspension. Getting back to the game, there were plenty of positives to take from the clash. Adam Matthews put in an excellent display and Luke O’Nien seems to be improving with every game. 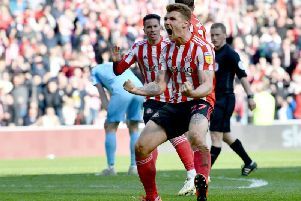 I’ve got to hold my hands up and say that I doubted that O’Nien would have a positive impact after his first few games in a red and white shirt, but I’m happy to have been proved wrong going by his last couple of performances. While the fightback on Saturday, and a couple of individual displays were positives, we were guilty of some poor defending at times. At this level you may be able to get away with more mistakes than you would in the Championship and definitely in the Premier League, but there is room for improvement. I realise that Sunderland under Ross is still a work in progress, and the positives so far outweigh the negatives. But having said that we would be fairing even better if we could cut out some of the costly errors. Speaking of errors Saturday’s man in the middle was absolutely shocking – and I think that is being kind. For me, Craig Hicks got a number of big decisions wrong, albeit on second viewing I think the red card might have been right. That aside Hicks had a very poor game in my opinion and the referees’ assessor should have plenty to report, I’m just not sure any of it will be good. That said we’re still in second after the draw and that’s certainly another reason to be cheerful.